If you think treasury-making on Etsy is a quaint pastime, you’re doing it wrong. Kelly Tankersley of 88editions has been on Etsy’s front page 450 times, and she’s here to reveal how treasuries can be a serious part of your marketing strategy. Fine art is a hard sell on Etsy, but Kelly’s treasury prowess – and talent, of course – has netted her art over 200 sales and 9,000 admirers. I started my Etsy shop in fall of 2010. As a former marketing manager, I knew I couldn’t just list items and wait to be discovered. I launched my shop – packed it with items, started a blog and looked for other ways to promote. I caught on to treasuries early, when someone included one of my items in a treasury; I was thrilled, and quickly returned the favor. I’ve been a treasury addict ever since. So why are treasuries important? Exposure, exposure, exposure. Make one treasury and you’ve reached out to 16 other shop owners. Sellers are amazing at reciprocating; my items are featured in 20-80 treasuries a day. Every few days, one of them hits the front page. Be generous and celebrate others – you may just find that karma works. Fair warning – making treasuries is addictive! It’s short-lived art with instant feedback, and an occasional 15 minutes of fame. It’s important not to belabor your treasuries – have fun, make them quickly and don’t second-guess your creative intuition. The hottest tip for treasury-making is to build your favorites list. I have over 80,000 items in my favorites, which means I have a deep well of great listings at my fingertips. I haven’t “cold searched” on Etsy in years. Any time I’m included in a treasury, I visit the curator’s shop and favorite items that catch my eye. For my treasuries, I pick an item from one of my treasury teams as initial inspiration. I try to start with a “wow” picture as the lead to set the tone and color scheme. I don’t want to surround it with other bold images that would compete for attention, so I like to use what I call “palette cleansers” – simple, minimal items that complement rather than distract. I make all my treasuries with Brittany’s own TreasuryBox. It makes treasury-making easy breezy! I make at least 3 treasuries a day and close to 100 treasuries a month, so TreasuryBox is a godsend. Making tons of treasuries means you’ll get featured in tons of treasuries. Improving your tags and photos will help curators find and use your items in beautiful, front-page worthy treasuries. Tags are dual-purpose; good tags will lure both shoppers and treasury curators. It’s easy to get in a tag rut and only put in literal phrases for your item and its materials. Try to focus on color, style and themes that might apply to your item. If you’d call something teal, throw aqua or turquoise in there. For a listing that looks modern, a “minimal” tag might also be a good fit. I’m always surprised when sellers don’t use up all of their tags for an item. Take your time, experiment and perfect your photos. Many photos have a gray tone to the background; taking photos outside or near a window on a bright day will help. Photo editing applications have contrast or brightening filters that can take a photo from dull to wow. If you’re a true technophobe, Picasa makes it idiot-proof with an “I’m feeling lucky” button that fixes contrast and color in one click. Sticking with a theme and brand for photos in your shop is important, but making all your photos look the same lessens your chances for treasury inclusion. Adding a botanical element next to your pretty clutch might get it picked for a woodland treasury, but it will miss the mark for a modern treasury. Mix up your photos and play with symmetry (or asymmetry) to give curators plenty of options. There are tons of Etsy teams devoted to making treasuries – and more importantly, putting team members in treasuries. Joining a treasury team is another great way to get your items featured. I’m active in over 20 treasury teams – did I mention I’m addicted to making treasuries? I love the joy of cross-marketing with treasuries; collaborating and building relationships with other shop owners – and the true thrill of making a treasury that gets my teammates on the front page. Some of the teams that get regular front page exposure are invite-only. The best way to get invited to these teams is to have great photos and a history of making great treasuries. I’d suggest joining one of the many open treasury teams to get started. I like teams with about 50 members and high treasury quotas, but I am also on many giant inclusive teams and love the energy there! If you think you’re a great fit for a team that’s invite-only, go ahead and apply. I emailed the captain of an invite-only team that I admired; I saw that she’d already filled her quota on art members, but let her know I was interested if an opening ever came up. A year later she remembered and invited me in! Don’t be shy, you have to put yourself out there. Kelly Tankersley of 88editions is a printmaker, collage artist and nature lover living in the Austin Hill country. When she’s not making treasuries, Kelly creates art with handmade paper from plants in her garden. 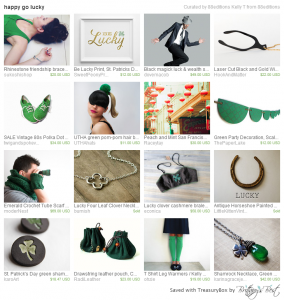 Treasuries are a fun way to market your shop and get involved with other sellers in the Etsy community. It’s not the only path to success – I know plenty of Etsy tycoons who barely make any treasuries – but it’s a powerful tool to get exposure for your shop. Is it time that you gave treasury-making a try? 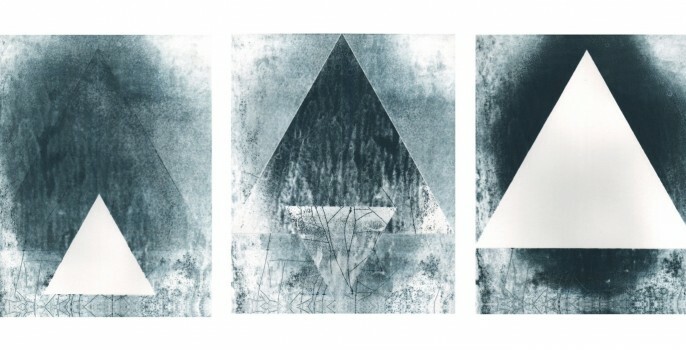 Cover image: Triad three-print set by Kelly Tankersley. This is a great article! I really think this will help get me started! This is so very helpful for a newbie to Etsy! Great tool, just used it for the first time today – thank you! Great ideas and helpful insights! Super awesome advice Kelly!! Been wonderful having you as a teammate all these years!! What a useful and informative article! Great tips Kelly – thanks so much for sharing your experience! Superb advice for marketing on Etsy, Kelly! Great tips on creating amazing treasuries! Wonderful insight! Great tips, Kelly! Such a remarkable interview!! Thank you so much, Kelly!! LOVE it!!!! awesome tips, kelly. anyone thinking about making treasuries should read this. I absolutely agree. Treasury making is a huge part of my marketing strategy. For the last few months, I’ve been busy with travel and other projects, and I have’t made as many treasuries. It’s impacted sales for sure. Oh, and Kelly’s the best! Love the advice and the joy that Kelly is spreading around for treasury making! Great article with practical and real tips. Thanks so much. I’ve been on Etsy for over 5 years and I never thought of using treasuries like this. Great idea. Wow, this is super helpful. I am going to give this a try. Would you mind it I linked to this post from my website? I blog about my Etsy Store and about being a new Etsy store owner. Noemi, I don’t mind a link at all! I’m always grateful for anyone that spreads the word about articles, especially if you can put your own spin on it.